HD/SD short-delay broadcast down converter and distribution amplifier in a minibox. Because no other minibox down converter shares Q-Down Mini's level of conversion quality nor the short processing delay of just 16 lines which eliminates the need to compensate audio signals for the video delay. Plus there's the flexible outputs – with one loop-through, a dedicated SDI and three SD outputs configurable as mixtures of analogue and digital. You need to provide down converted feeds for your SD monitors – and you've run out of rack space. It's perfect for attaching directly to the back of monitors. See who's using it. Q-Down Mini is a standalone down converter designed to meet the demanding requirements of broadcasters. Q-Down Mini combines the three winning advantages of outstanding picture quality, short processing delay and competitive pricing to create the perfect minibox for attaching directly to the back of SD monitors in space-challenged environments with no spare rack space. Q-Down Mini provides a unique level of image quality in its price range – avoiding aliasing while retaining picture sharpness. The sophisticated two dimensional filtering gives broadcast results without the complication of looking at multiple fields or movement detection – resulting in reliable, artefact-free conversion. Should you want to optimise the performance for your material, you can also choose from four alternative vertical filter characteristics - sharpest, sharp, softest and soft. Q-Down Mini features flexible outputs, with a reclocked loop-through of the HD or SD input, a dedicated SDI output and three Standard Definition outputs individually link selectable between analogue (composite, Y/C, YUV and RGB) and digital. It can down convert 720p and 1080i High Definition at both 50Hz and 59.94Hz, with the down converter bypassed if the input is Standard Definition. Q-Down Mini’s short processing delay of just 16 lines ((or 52 lines with Letterbox conversions) eliminates the need to compensate audio or other signals for the video delay, keeping everything in sync and making your system design much simpler - and makes it easy to detect real lip sync errors when you're monitoring the video and listening to separate audio. There are also three fixed video delay settings available: ‘minimum’ (16 or 52 SD lines processing delay, depending on the conversion), ‘fixed’ (52 SD lines) and ‘frame’. The ‘fixed’ 52 lines delay allows the aspect ratio to be changed live on air without any picture disturbance, while the ‘frame’ of delay can be used to match a variety of equipment or alternatively to connect with equipment that has no delay. Other useful features include the ability to deal with any HD to SD aspect ratio conversion requirements, with the option of selecting a 16:9 Anamorphic output for 16:9 SD systems and either a 16:9 to 4:3 Letterbox or 16:9 to 4:3 Full Screen with centre cut for 4:3 SD systems. The aspect ratio can be controlled remotely by using the GPI connections, and setting DIP switches 1 and 2 to follow GPI. Q-Down Mini’s compact 165mm x 80mm x 28mm size means it fits easily on the back of a monitor – with the flexibility to be orientated in any direction to fulfil the requirements of your application. The base includes two M3 threaded inserts which make it easy to mount it to a suitable back plate. All settings are configured by ten mini DIP switches on the outside of the box, with the Standard Definition outputs selected by using a combination of these switches and internal moveable links. Two LEDs indicate the presence of power and an active HD or SD serial input. 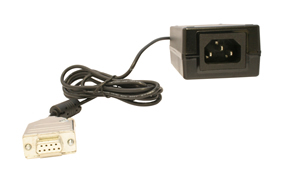 Q-Down Mini features six BNCs for the video signals and a 9-way D-Type plug for the power connections and access to the GPIs, with a separate external universal AC power supply (pictured here) available. Differential phase: +/- 1 degree typ. 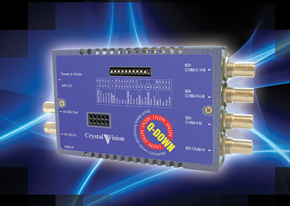 Q-Down Mini is different to the rest of the Crystal Vision product range. It is a minibox and so does not fit in a rack frame nor use a rear module. Q-Down Mini provides a reclocked loop-through of the HD or SD input, a dedicated SDI output and three Standard Definition outputs individually link selectable between analogue (composite, Y/C, YUV and RGB) and digital. For more visual technical information, download the Q-Down Mini block diagram. Because Q-Down Mini is a standalone minibox, you don't need to buy a frame nor rear module. Q-Down Mini is controlled by mini DIP switches on the box or GPIs - therefore you will not require a control panel or PC software.